Contrary to his name, the English Toy Spaniel probably originated in Japan and perhaps China. They were likely brought to England in the 16th century where they became very popular with the upper classes. These little dogs are gentle, happy and playful. They make excellent family companions and get along very well with children. They are usually very well-behaved and intelligent. They are also easy to groom. If you are searching for a Toy dog for your family, the English Toy Spaniel may be a good choice. The exact origins of this dog breed are unclear, but breed experts maintain that these dogs originated in Japan and the Far East and were brought to England in the 16th century. They were likely crosses between Pugs and small spaniels, and perhaps some other breeds. Also known as the King Charles Spaniel, this dog breed may have been known as “Comforter” Spaniels in the 16th century and they were favorites of many nobles. The early dogs all seem to have been black and tans and the breeding programs of the time focused on this variety, which was King Charles I’s favorite and named after him. The other color varieties appeared later. Some people suggest that this dog breed was used as a small hunting spaniel at the time but they were always intended to be companions. Today these dogs make excellent pets. The English Toy Spaniel is bright, interested, affectionate and willing to please. These are gentle, happy, loving, sweet little dogs. They are generally intelligent and naturally well-behaved dogs. In the home they are usually quiet and easy-going. They get along well with other pets and they are very good with children. They don’t bark a lot but they are an adequate watch dog, letting you know if someone comes to the door. The King Charles Spaniel has been bred to be a companion dog for centuries and they make a fine family pet. Living Environment – These dogs do very well as apartment dogs. They are not terribly active but they do require some exercise each day. They will enjoy a small yard if you have one, but they don’t do well in extremely hot or cold weather so do watch out for these extremes. They do have a shortened nose so be particularly careful in hot and humid weather. Grooming – This dog breed is easy to groom. They should be brushed regularly but they don’t require any particular trimming. They are average shedders. Diet & Exercise – Dietary needs are in the “regular” category. They can be picky eaters at times, so feed them a regular diet and don’t be fooled into providing extravagances or your dog may start becoming more and more finicky. They require moderate daily exercise. A good walk is ideal. Health – This breed can be prone to respiratory problems, mitral valve disease, luxating patellas (slipped kneecaps), dog eye problems and ear infections. Since they do have a shortened muzzle they can have problems in hot and humid weather. If you are interested in this dog breed, you should talk to a breeder about possible dog health problems. 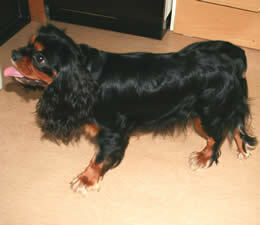 English Toy Spaniels are intelligent little dogs and they have a strong desire to please their owners. Dog training is considered easy for this breed. These dogs do very well with positive dog training techniques (praise, rewards). They can be somewhat picky about food so you may need to use some other reward, such as a play session or tummy rubs instead of food treats. Find something that will motivate your dog as a reward. It could be something as simple as lots of praise.